Gonzalo Higuain's expected loan move to Chelsea is still being worked on, according to AC Milan assistant manager Luigi Riccio. Higuain was left out of Milan's team for their 2-0 win over Genoa in Serie A on Monday, with manager Gennaro Gattuso admitting the striker has told him he wants to move to Chelsea. 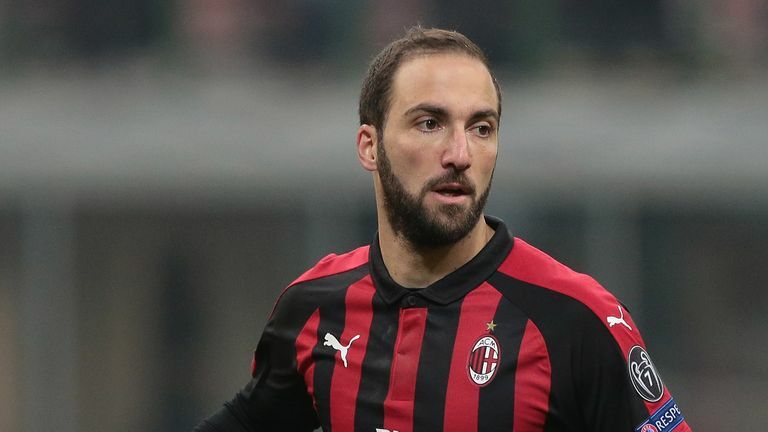 The 31-year-old is currently on loan at Milan from Juventus, but Sky in Italy report Chelsea have agreed a deal with Juve to sign Higuain on loan until the end of the season, with an option of a further 12 months. However, Riccio told Gazzetta: "As for the transfer market we are all grown-ups, we know how to deal with these situations. "It has been in the air for a few days. But we will work with the players at our disposal." Higuain's move to Chelsea is believed to be being held up by Milan's negotiations with Genoa for Krzysztof Piatek, who the Italian side have identified as a replacement for the Argentine. However, Sky in Italy understands Milan and Genoa will meet on Tuesday to finalise Piatek's move - expected to be worth more than £30m - which should then allow Higuain to depart. Sky in Italy also understand Alvaro Morata is poised to join Atletico Madrid on loan until the end of the season, with an option to make the move permanent, paving the way for Higuain to move to Stamford Bridge. Should Higuain move to London, he would link up with Maurizio Sarri, under whom he equalled the Serie A record for goals scored in a season, with 36 for Napoli in 2015/16.